About five years ago I saw a fantastic World War II movie from 1964 called The Train. Directed by John Frankenheimer, The Train stars Burt Lancaster as a French resistance member who has to stop a train bound for Germany that is carrying priceless art treasures. Filmed in grimy black and white, the film eschews any silliness like having Lancaster put on a fake French accent, and scores high marks as both a drama and an action film. The reason I bring up The Train is because I couldn’t get it out of my mind while watching René Clément’s film La Bataille du Rail (The Battle of the Rails). 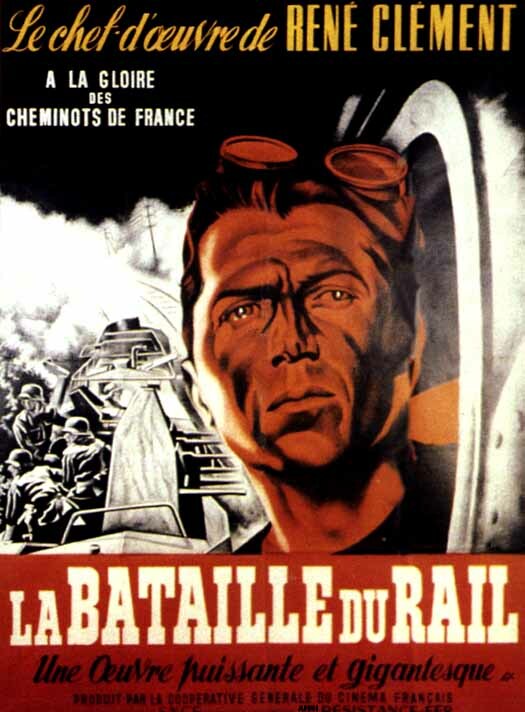 If Frankenheimer and his crew didn’t study La Bataille du Rail when they were making The Train, I would be surprised, since Clément’s film is a landmark of vérité war action, and some of its action sequences are very similar to ones found in The Train. The gritty look of the picture also seems to have influenced Frankenheimer. Unfortunately, La Bataille du Rail doesn’t score as highly as a dramatic film, which would be fine if it were a documentary, but it’s not. It only looks like one. The film opens with the following preamble: “This picture, which recalls actual scenes of the Resistance, was produced in cooperation with the Military Commission of the Resistance National Council.” How accurately any of the action reflects what actually went on during the war, however, I don’t know, but they unquestionably derailed an actual train during the climax, which was impressive. There are many characters La Bataille du Rail, but they are played by unprofessional actors (who are listed in the opening credits only by surname), and they are never really allowed to develop personalities. The structure of the film is episodic, and depicts an escalating war of attrition. The resistance sabotages trains necessary to the German war effort, and the Germans respond by executing members of the resistance and increasing their military presence on the tracks. At points, the film reminded me of Sergei Eisenstein’s 1925 film Stachka (Strike) in the way that it placed its numerous human characters against an enormous backdrop of industry. The smoke and grime from the trains covers everything, and the machinery dwarfs the people fighting and dying all around it. There’s an impressive nighttime battle sequence that ends with a resistance member being run over by the treads of a tank. It viscerally drove home the message that while the spirit of a collective can accomplish remarkable things, the integument of a single human body can be crushed by the machinery of war as easily as a person can step on a grape. Most of the visuals in La Bataille du Rail are impressive because of their scale, but there’s one memorable scene that achieves its impact more subtly. A group of resistance members are lined up against a wall by the Germans and shot one by one. The camera lingers on a single man’s face. He grimaces as each shot is fired. The shot then cuts to what he is seeing; a spider spinning its web along the wall. It’s the last thing he will ever see. It’s a remarkable sequence, and one that makes its point without any dialogue. I watched La Bataille du Rail immediately after watching Roberto Rossellini’s Roma, città aperta (Rome, Open City), another film about resistance under the Nazis that is shot in a semi-documentary style. In my review of Roma, città aperta I complained about some of the characters and the melodramatic storyline, which I felt undercut the impact of the more vérité material. La Bataille du Rail went completely in the other direction, and never developed its human characters at all. It’s effective in the context of the film, but keeps the viewer at a distance. It’s an impressive film, and I’m glad I saw it, but I’d sooner watch The Train again than La Bataille du Rail. It probably didn’t help that the DVD I watched, from Facets, looked like crap. The film could do with a restoration. The print was fuzzy, and the nighttime scenes looked muddy and were occasionally confusing because of it. Posted in 1946, February 1946 and tagged Arthur Mayer & Joseph Burstyn, Charles Boyer, Colette Audry, Coopérative Générale du Cinéma Français, Fernand Rauzéna, Foreign Films, François Joux, French Cinema, Henri Alekan, Jacques Desagneaux, Jean Clarieux, Jean Daurand, La Bataille du Rail, Léon Pauléon, Marcel Barnault, Max Woll, Michel Salina, Pierre Latour, Pierre Lévy, Pierre Lozach, Pierre Mindaist, Redon, René Clément, Robert Le Ray, Tony Laurent, Union Française de Production Cinématographique, War Movies, World War II, Yves Baudrier. Bookmark the permalink. A nicely-written review of an overlooked film to which Frankenheimer’s “The Train”–itself a great movie—certainly owes a great deal. Thank you!